I started with a V-Star 650. It always felt as if I needed another gear on the open highway. I traded up to the V-Star 950 Touring and the difference is amazing. This bike is so well balanced and has the power that is great for the open road. I am 5' 5" and when sitting in the seat, my feet are comfortable on the ground. 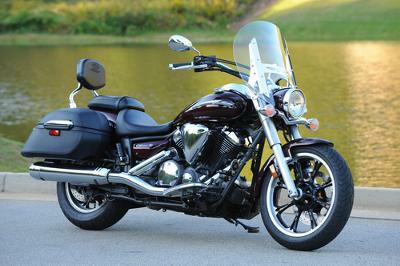 My husband even says it rides out better than his V-Star 1100. 950. I WANT THE GO ACROSS CANADA AND THE US AND I want a nice looking bike and comfort and a good ride please help me decide. Money made my decision this time, the 1100 was too good a deal in this economic times. My husband has an 1100. He has rode my 950 on a poker run while I was out with surgery. Although he LOVES his 1100 he swears mine handles better. If your happy with your 1100 Then you made a great choice. I thought I was gonna hold out for the new 950. But found such a deal with a used 1100. It's got just what I needed and i spend half the price. You gals will have to let me know if I should've held out for the 950. What a beautiful bike. I have been driving for a little over a year, and am looking at the 950 Touring also and listening to what you have just said I can't wait till Christmas. Thanks for sharing and stay safe. Congratulations on the bike, very nice!! That's my plan as well. I love my 650, but never seems to have enough power and just winds out at 70 mph. Can't wait to get my 950.